The figure below presents WBS’s latest (as of 24th August 2017) probabilistic forecasts for real GDP growth and inflation – for 2017 and 2018 – as histograms. Inspection of both the figure and Table 1 below reveals that economic growth of between 1% and 2% is forecast for 2017; and, relative to one quarter ago, the probability of lacklustre growth of less than 2% has increased from 68% to 88%. The prospects for growth in 2018 are considerably more uncertain than in 2017. Relative to one quarter ago there has been an increase, from 48% to 55%, in the probability of growth greater than 2%. And there is now a 25% chance of growth greater than 3% in 2018 up from 18% one quarter ago. Although the pound has depreciated since the referendum last June and inflation has picked up, relative to one quarter ago, there is now a lower probability that inflation exceeds 3% in 2017 – the probability has fallen from 25% to 10%. There remains, however, a 23% probability that inflation exceeds 3% in 2018, although this probability forecast has fallen from 32% one quarter ago. Accordingly, we take the most recent forecasts from the Bank of England and the HMT panel of independent forecasts. 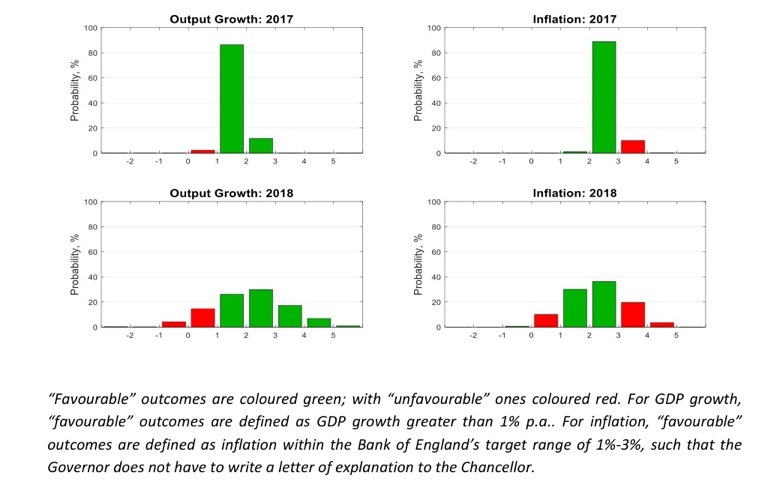 While the Bank of England provides an explicit assessment of forecast uncertainties for the UK, via “fan charts”, the HMT Panel provides point forecasts only. Looking at GDP growth, Table 2 shows that both the Bank of England and the HMT Panel increasingly agree with the WBSFS that growth in 2017 will likely not seriously disappoint – there is now close to a consensus that growth in 2017 will be around 1.6%. Since Brexit, the Bank of England and the HMT Panel have revised up their GDP growth forecasts for 2017 towards the higher values the WBSFS has been consistently predicting. This is consistent with the view that Brexit has yet to disrupt historical relationships between macroeconomic variables; and accordingly these forecasters’ central forecasts are more-in-line with the judgement-free forecasts produced by the WBSFS. But these forecasters do remain more pessimistic about GDP growth in 2018 than the WBSFS, with the WBSFS forecasting a 63% chance that growth exceeds the Bank’s central expectation and a 71% chance that growth exceeds the HMT Panel’s central expectation. Table 2 reveals how the HMT Panel forecasts for inflation in 2017 fall closer to the centre of the WBSFS forecast distribution than those of the Bank. It also reveals that the WBSFS forecast distribution itself is narrow given that the HMT Panel and Bank forecasts are fairly similar (2.59% and 2.70%) but that the probabilities of a higher outturn in Table 2 are 20% points different. Looking ahead to 2018 the WBSFS is now forecasting, relative to one quarter ago, a slightly higher probability of lower inflation in 2018. Table 3 shows that the WBSFS now forecasts only a 39% and 36% chance that inflation in 2018 exceeds the Bank and HMT Panel forecasts, respectively, whereas one quarter ago there was more of a consensus that inflation in 2018 would be around 2.5% with the probabilities closer to 50%.